UNITED NATIONS, April 21 -- The $160 million the IMF is disbursing to Iceland was delayed for months. In Iceland's Letter of Intent leading to the disbursement, the government commits" to ensure that the United Kingdom and the Netherlands will be reimbursed in respect of deposits of Landsbanki [Icesave] branches in those two countries." When the IMF's IMF mission chief to Iceland Mark Flanagan held a conference call on April 21, Inner City Press asked him to discuss the commitment of the government to pay principal and interest, and "reimburse" the UK and Netherlands. Flanagan argued that the above quoted Paragraph 20 of the Letter of Intent was "not from us." He said, "any language was fine with us" and that the language was "not critical." Some may find this hard to believe, akin to other IMF claims that it does not impose conditions any more, but simply makes suggestions. Inner City Press followed up by asking Flanagan to describe the IMF's -- including the Executive Board's -- communications with the Netherlands and UK. Flanagan replied that IMF staff are "not involved in bilateral disputes." But what about the Executive Board, which in turn communicates with the IMF staff? 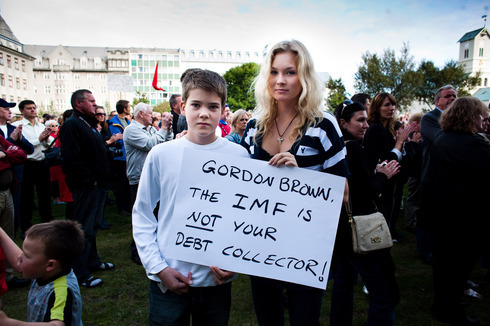 Iceland protest of IMF, but is the statement true? Inner City Press asked Flanagan for the IMF's thoughts on Iceland Central Bank governor Mar Gudmundsson April 16 statement to state TV station RUV that "a bank could collapse without me knowing of it. There haven’t been any changes, and all the problems that arose in the run up to the collapse and in the collapse are unsolved." Flanagan said he wouldn't respond to the Central Bank governor's quote, because he didn't know its context. It seems pretty clear -- "there haven't been any changes." The most recent report on Iceland identifies Citigroup, Deutsche Bank and Morgan Stanley among others as having fueled the crisis. Inner City Press asked Flanagan about these three companies and what is being done to see it doesn't happen in the future. While not responding directly, Flanagan said that there is nothing in the new report he wasn't aware of, and that he is confident that the government is dealing with all of it. We'll see -- watch this site.